I'd like to DVR it. Here’s the picture of the light being sucked into the black hole. The most amazing thing about the image I think is how clearly the Doppler effect shows up. However I'd say it's still a bit too low resolution to make a conclusion on whether it validates the strangest aspects relativity with respect to black holes. During the questioning which is happening now they mentioned the shadow edge appears a bit blurry due to the limits of the array resolution, and there is also a bit of asymmetry in the shadow which they want to do further research into, and to me it does appear to be a bit egg shaped and not perfectly circular. And that's what it looked like 55 million years ago. Man that's just insane. 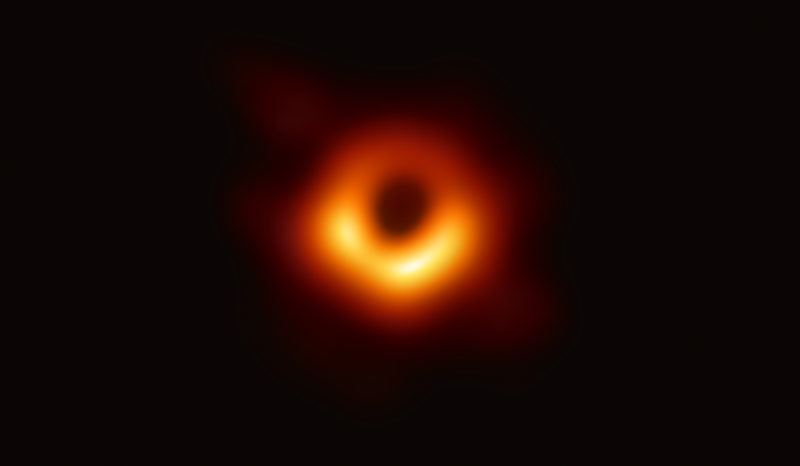 Maybe someone who knows a bit about block holes can answer this; there is no sign of a line through the center of the shadow, so I assume the accretion disk isn't being viewed edge-on? I'm guessing it must be tilted on an angle, if we were looking side-on at the disk from a perfect 90 degree angle no part of it would be rotating towards or away from us at different speeds and we wouldn't see such a clear bright spot. Also, if we are looking at it on an angle, should so much of the disk be bright like that? They did mention some parts of the disk appears to be strangely bright, and I can't really work out how an entire half of the disk, would be moving towards us, it almost looks like more than half actually. Yesterday, the black hole imploded into itself creating an entirely new Universe, the edge of which will reach us in 55 million years. So, by the time we are able to see the effects of the event, the event will be upon us. Because remember, we're looking at the past here. It's all so mind bending. I was just thinking about that. We're getting a 55,000,000 year old image here and it's breaking news. I can only imagine what it looks like in 2019. Where did 55 million come from? The galaxy is only 100,000 to 120,000 lys across and we live about 2/3s of the way out so at most it's 30-40,000 lys away. I personally wanted to see the photo of Sgr A* even if it doesn't present as pretty a picture! Sometimes a jangled mess can tell you a bunch too. Uh, um, uh, whatever that means!! @ChaoticOrder, since the BH is warping space around it, I don't think it matters what angle we see it. Add onto it SMBH are spinning near the speed of light anyway, I am not certain that moving towards us would factor that much more into the image. I am thinking it is like seeing dawn behind a mountain before the sun actually rises.